Sometimes murder is child’s play…. I read this in one sitting last night and my skin is still crawling – my mind feels slightly disconnected, altered somehow. Don’t let the Blyton-esque cover fool you. This is a dark, deeply disturbing portrait of childhood gone wrong, in the vein of The Wasp Factory and We Need to Talk About Kevin – not for the easily perturbed. The nameless narrator is a twelve-year-old girl whose parents “got smushed to death in a boating accident when I was nine. Don’t worry – I’m not that sad about it.” Sent to live with her true-crime-obsessed Grandma, the girl develops an unhealthy interest in serial killers. Spending the summer with her aunt and uncle who run a crappy hotel in Fowey, Cornwall, that interest will spiral out of control. Two exciting things happen that summer. Firstly, the body of a naked woman is hauled out of the sea. Secondly, a thirteen-year-old boy called Miles comes to stay in the hotel. Completely dominated by his vile mother, Miles is unlike other boys, and the girl becomes Miles’s first friend. 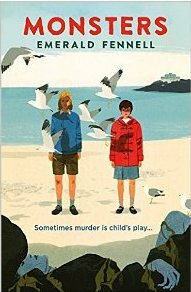 They quickly discover they share a passion for the macabre, and deciding to investigate the murder (as the police, they agree, are hopeless), the pair show the reader the underside of Fowey – not so much picturesque fishing village, as Royston Vasey by the sea. They also enjoy passing time playing the “murder game”, in which Miles attempts to strangle or drown the girl – a game which hints at the darker turn the story will inevitably take. As their friendship develops, and it becomes clear that a real serial killer is on the prowl, the pressure builds and builds until the children’s repressed emotions break free. The narration is superb – the girl’s voice is as clear as crystal and utterly compelling. And through her narration we see the truth of things – yes, the children are monstrous, but so are the adults that surround them, who turn blind eyes to the children’s trauma and saturate them with shame. It is little wonder that things turn out the way they do. This is a portrait of how children turn bad, and how society likes to pretend that it happens in isolation – the children must have been “born evil”. The truth is far more disturbing. Monsters is not for the faint-hearted – it’s ending is very shocking and the themes that it explores are uncomfortable in the extreme. But it’s brave and original, and lingers long in the mind. I really couldn’t put it down – it’s exceptional. 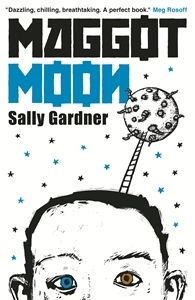 Aimed at a young adult audience, I would recommend this for 14+ to adult; and I think it’s definitely a novel adults should read, as it raises a dark mirror to the way we raise (or fail to raise) our children. This was an interesting one to review – it tackles a subject close to my heart, and is by an author whose novels I have enjoyed, but with whom I don’t always agree. Her public reaction to Melvin Burgess’s Doing It being a case in point – the golden rule is don’t criticise a novel if you haven’t actually read the whole thing! So I was intrigued to know how she would deal with the subject of adoption, which is often surrounded by myths and misunderstandings. And I was pleasantly surprised. When a nosey neighbour sees little Eddie peering out of the window, a child that shouldn’t be there, she calls Social Services and before long Eddie and his mother are rescued from the hands of brutal Harris. But his mother has been beaten once too often, and is broken and damaged beyond repair, incapable of looking after her four-year-old son. So Eddie is placed in foster care, and eventually adopted by a couple who have already adopted an older girl. Eddie initially thrives, but unbeknown to his new family, he is haunted by the fear that he will turn out just like Harris. And as he hits his teenage years, this fear leads him to discover alcohol, and he starts a spiral descent into his own worst nightmare. Will he be saved for a second time, and is nature more powerful than nurture? The story is told from various perspectives, and Eddie’s voice in particular is powerful and poignant. 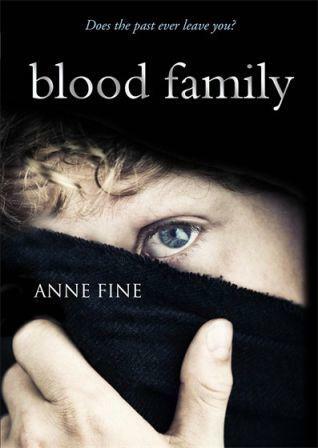 Anne Fine succeeds in capturing both the adolescent turmoil of a typical boy and the added dimension of adoption – the fear of the past and the future, a sense of not truly belonging, and confusion over identity. Other voices however fare less well, and the adoptive parents in particular come across as well-meaning but inadequate, not realising why Eddie is in trouble or indeed that his situation is becoming so desperate. Eddie’s biological mother is also denied a voice of her own, and seen only through the eyes of those who pity or despise her – a missed opportunity really to examine the complex situation of women surviving domestic violence. The social worker is also a little clueless. In all, I woudl say the younger characters are depicted well but the adults tend to be stereotyped and rather more one-dimensional, so the analysis of the issues involved is limited. Noughts and Crosses was one of the most popular and powerful books I shared with students in my days as a school librarian, and its uncompromising depiction of racism assured that Malorie Blackman has a devoted following amongst a generation of young people. Noble Conflict will be enjoyed equally. It tells the story of Kaspar, an eager young recruit to the Guardians, who is trying not to rely on his parents’ reputation as Guardians before him. Kaspar is determined to make his mark and defend his world, which is beset by seemingly random but terrifying terrorist attacks by the rebels that live beyond the city. But he uncovers instead a horrifying conspiracy, which threatens all that he believes in. How far will he go to protect his world, when nothing is as it seems? Another lovely creepy tale! 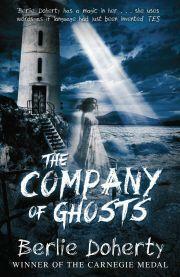 This genuinely scary story for teenagers is set in 1958. Cora and her little sister Mimi are packed off to stay with Auntie Ida in the country by their feckless father, who doesn’t want to look after them. Ida doesn’t want the children either but for very different reasons – there’s a horrible history of harm that comes to children at Guerdon Hall, and she’s desperate to stop it happening again; but lumbered with the children she is paralysed by fear and unable to prevent the supernatural stirrings of an ancient evil… Before long Cora is aware of a ghostly presence in the house, and as she and her new friends Roger and Pete explore the local church they encounter more terrifying spectres. 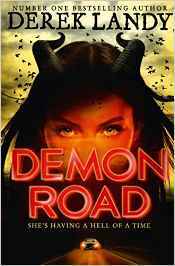 As the vengeful spirit of Long Lankin sets his sights on innocent Mimi, can Cora stop him and save her sister? For some reason I thought this would be an amusing read to cheer me up after the dark intensity of Then by Julie Myerson – whoops, I got that wrong! But I don’t regret it. It’s a novel that takes familiar concepts and succeeds in creating something very fresh and involving, with a brave and unforgettable climax. Standish’s narration is very convincing and he’s an average teenage boy with a spark about him. It takes a while for the penny to drop, as he takes his world for granted, but this is a story where the Nazis won the Second World War and Standish is living in a totalitarian state. Part of the ongoing efforts of the ruling elite is to win the space race against America – the land of “Crocas-Colas” and cadillacs – and it’s the Resistance’s efforts to disrupt this that blows Standish’s world to smithereens. This is a shocking story in parts, but it’s not without charm, as our hero tries to interpret events in his own way. The ending is superb – and I have to admit, that sitting in the staffroom at work, it made me cry. You can’t say more than that.